Oil on canvas, 48 x 63,5 cm. Throughout his life, Eckersberg harboured a great love for ships and was at times also very concerned with painting them. At one point, he even considered writing a thesis about the demands posed to an artist by marine and seascape painting. 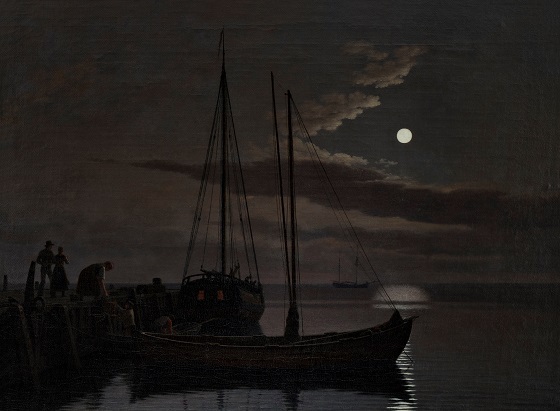 This early evening picture with a tiny, white moon that casts its light over a scene with ships and people unloading from one of the boats is rare amongst Eckersberg’s marine productions. The still, silvery grey water and the moonlight on the clouds and water result in a clean, clear and highly evocative expression. Atmospheric images such as this did not become a typical genre for Eckersberg, as the dark palette and dim lighting did not harmonise well with his scientific approach to perspective and compositionition.